“There is nothing like a Dane!” is often heard from fanciers of this breed. And while size alone makes him unique, the Great Dane’s personality is the quality that most find so appealing. The Dane is a “people dog” – a sensitive and affectionate companion. They can be elegant and dignified one moment, and the playful and silly the next. They were originally developed in Germany to hunt wild boar. And although they are no longer used for that purpose, they should still possess the confidence that made them suitable for that work. Because of their temperament, and the fact that they are generally clean and quiet, they make ideal inside-the-house pets. They do not make good “yard” dogs, because when segregated from human companionship, they can become very unruly and destructive. Puppy buyers should always be sure to see at least the dam of the litter (and the sire if possible). Puppy temperament is influenced by both heredity (from the sire, dam, and other ancestors), and by the environment (which is greatly influenced by the dam, and the breeder’s rearing practices). Anyone buying a puppy should ensure that the dam does have a temperament that conforms to the breed standard and that the breeder is raising the puppies properly (in the house as part of the family), and is providing adequate socialization and early training. The AKC OFFICIAL STANDARD FOR THE GREAT DANE states: “The male shall not be less than 30 inches at the shoulders, but it is preferable that he be 32 inches or more, providing he is well proportioned to his height. The female shall not be less than 28 inches at the shoulders, but it is preferable that she be 30 inches or more, providing she is well proportioned to her height.” It is common for males to stand about 35 inches at the shoulder, and to weigh about 150 pounds. Females are commonly about 32 inches tall and weigh about 120 pounds. Puppy buyers should remember that “bigger”, is not necessarily “better”. Color classifications being well-founded, the Great Dane Club of America, Inc. considers it an inadvisable practice to mix color strains…” Puppy buyers who are interested in showing or breeding should be sure to purchase a puppy with show potential, who is also one of the five recognized colors, and who is also pure color bred. Boston and merle are colors that are often seen in harlequin litters, and while these colors are not permitted in the conformation ring (in the U.S.), individuals of these colors can make fine pets, and can also participate in other types of competition (obedience, tracking, agility, flyball, etc.). 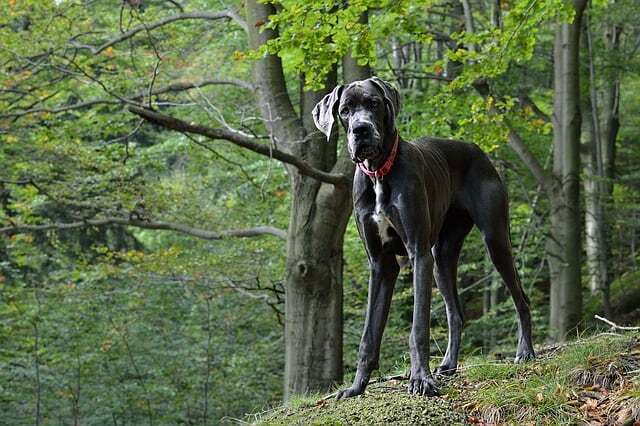 Danes are born with ears that (according to the breed standard) should be “high set, medium in size and of moderate thickness, folded forward close to the cheek. The top line of the ear should be level with the skull.” Ears may also be cropped. Ear cropping is an optional cosmetic surgery which enables the ears to stand. Aftercare (taping, etc.) is also necessary to ensure that the surgery will be successful. If you choose to have your puppy’s ears cropped, please contact your breeder, or your local Dane club, for a referral to a Veterinarian in your area who is proficient at performing this surgery and after-care. The Dane is a short-haired breed and therefore requires little in the way of coat care. Most do well with weekly brushing (more often during periods of heavy shedding) and bathing as needed. The Dane also requires ear cleaning, dental care, and toenail trimming like any other breed. Hip Dysplasia is a poly-genetic hereditary disease which can cause pain and lameness – even to the point of being crippling. The Orthopedic Foundation for Animals will review radiographs on dogs (two years of age or older) and certify the hip joint conformation as normal (free of Hip Dysplasia) with grades of Excellent, Good, or Fair. Hypothyroidism can cause a variety of medical problems and has been linked to auto-immune disorders. It is diagnosed with blood screening. Von Willebrand’s Disease is a bleeding disorder (similar to Hemophilia in people) and is diagnosed with blood screening. The Canine Eye Registration Foundation will certify a dog to be free of apparent heritable ocular disease based upon examination of a veterinary opthamologist. The dog must be re-examined and re-certified every 12 months. This testing is done to determine hereditary heart disease, including Cardiomyopathy. It is generally performed by a veterinary cardiologist. When interviewing breeders, a puppy buyer should ask for proof of (the above listed) screenings, and should also ask about other health problems including Gastric Torsion (Bloat), Seizure Disorders, Wobblers, and Orthopedic Disease (OCD, HOD, etc.). Breeders who deny any knowledge of any possible hereditary disease in their lines, as well as those who are not familiar with these diseases (and the screening process), should be avoided. Dogs who have been diagnosed with any heritable disease should NOT be used in a breeding program. The Great Dane is unfortunately not a long-lived breed. Their lifespan is generally 7-10 years. Longevity can be promoted by breeding healthy individuals (whose ancestors were long-lived), and by practicing good health management. But, even though the Dane is not long-lived, Dane lovers would agree that they’d rather have eight years with these dogs than twenty with another breed. Danes need a moderate amount of exercise. A long walk each day seems to suit most Danes nicely. 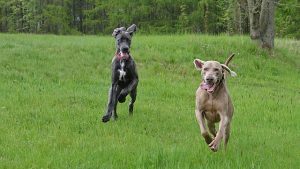 Of course, Danes can also be trained to participate in very athletic activities, such as competition obedience, tracking, agility, and flyball. Because of their size, an un-trained Dane can be a very serious hazard. Dane puppies should be started in a puppy training and socialization class at about three months of age. At that stage, they are very impressionable, and a relatively manageable size. For their own safety, and for the safety of their owners (and others), all Danes should be taught not to bite (even in play), and not to jump up on people (unless invited). They should also learn (at a minimum) the five basic obedience commands: heel, sit, down, stay, and come. Danes are a very sensitive breed, and (for the best results) should be taught using motivational/inducive methods. Because a 25-pound eight-week-old male puppy will generally grow to about six times that weight, special consideration needs to be given before acquiring a puppy. Dogs are abandoned every day because their owners didn’t realize that their cute little puppy would grow up to be a very large dog with real needs. Will I be able to provide enough food for a giant breed dog? They eat about three to six cups of high-quality dog food twice each day. Can I afford the other expenses involved with owning a dog of this size? Medication, crates, bedding, equipment, supplies, toys, etc., all cost more for a giant breed dog. Am I prepared to provide a Dane with the companionship and exercise he requires? Am I able, and willing, to provide positive and consistent training, beginning as soon as my Dane enters my home? If after considering all of these questions, you are still determined to add a Great Dane to your family, then do consider adopting a homeless dog from a rescue organization. Danes of both sexes and all colors and ages are often available for adoption. If you must have a puppy, then screen breeders very carefully before buying. Make sure that any puppy that you consider, has been bred and reared to have a correct temperament, and that the parents have been screened for genetic defects. An aggressive Great Dane can be a very dangerous dog, and a crippled or chronically sick Dane can be more of a burden than a pleasure. Remember that your decision to acquire a Dane is a decision that will affect you (and your Dane) for a lifetime.